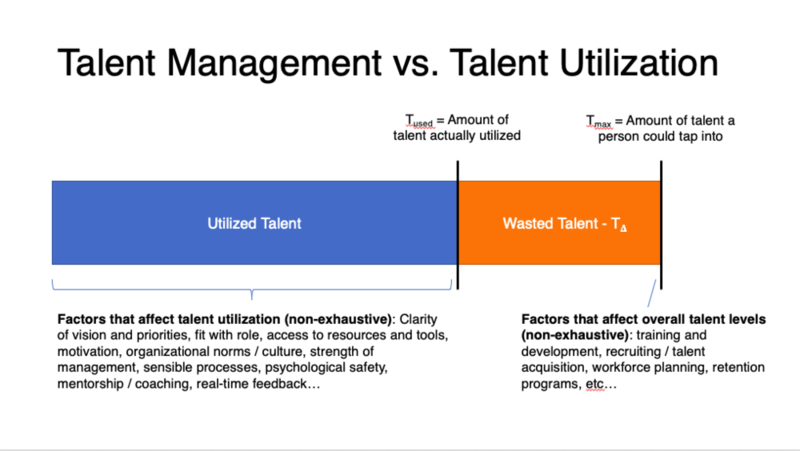 How does one create an organization that doesn’t waste its talent? When I worked as a management consultant, one of the recruiting buzzwords was "ambiguity." The idea was, consulting firms wanted people who were able to manage ambiguity and were comfortable operating in environments where there was a lot of it. Dealing with ambiguity was an indispensable skill. But now, I think I'd rather hire someone (and more importantly, be someone) who's uncomfortable with ambiguity. Someone who encounters ambiguity, and wants to solve the underlying problem causing it. Someone who takes ambiguity, and strives to make it clearer, simpler, and more actionable. In retrospect, I think it's probably better to have teams that are so annoyed by ambiguity that they try to do something about it. To be sure, I'm not naive enough to think ambiguity can be completely eliminated from enterprises. What I'm saying is that it might be better to build a team with people who will do something about ambiguity, rather than build a team who people who will have a high tolerance for it. Why not focus on less? There are four general strategies to make a company more profitable. I no longer expect work to be meaningful and I don't think you should either. Let me try to convince you. If you can convince others to advance a common interest more often than they advance their own interests, you've succeeded as a manager. That's it. Putting family first is not settling. It's actually quite the opposite. The potential gains from choosing an alternative to bureaucracy are enormous. It's my mission to imagine those alternatives and bring them to life. At work, we've abandoned typewriters and horses & buggies, but we still use management practices that are nearly a century old. Why aren't there more smart people in the industries that matter the most? In America, money isn't just a tool we use to buy things, it's a mental model that's hard coded into our brain from birth. I'm proud to present an independent study project I completed at Ross which translates Allan Afuah's business model framework so that it can be used by public-sector executives. Who do educators really see as their customers? It will be a game-changer if we can create an educational enterprise which truly treats students as the customer. Money is everything, and money is nothing. This is one of the most interesting insights I've had since starting business school. For a company, meaning the LLC-CCorp-faceless-legal-mumbojumbo contractual relationship, money is everything. Companies exist to generate a profit. Money is the means and the end. There is no reason to have a company if it does not make money. To be sure, it's not unfortunate if the company does other things instead of make money, but that's not the most function of a company. The most important function of a company is to make money. But a company is nothing without people. For people, meaning the air-breating-love-making-hand-holding-fun-loving-soul-filled humans, money is nothing. Everything that matters in life to people is precisely not money. We care about freedom, love, justice, god, greed, stability, pleasure, pain, prestige, and truth. Money only matters because it is a way to get one of those things that we actually care about. To be sure, money is important because it's how we can get those other things. For a person, money is a mere means that's not intrinsically valuable. But we need it. Paradoxically, money is everything and money is nothing.